Welcome back to yet another review, this issue had me raging mad at one scene in the middle but the rest was a good story. 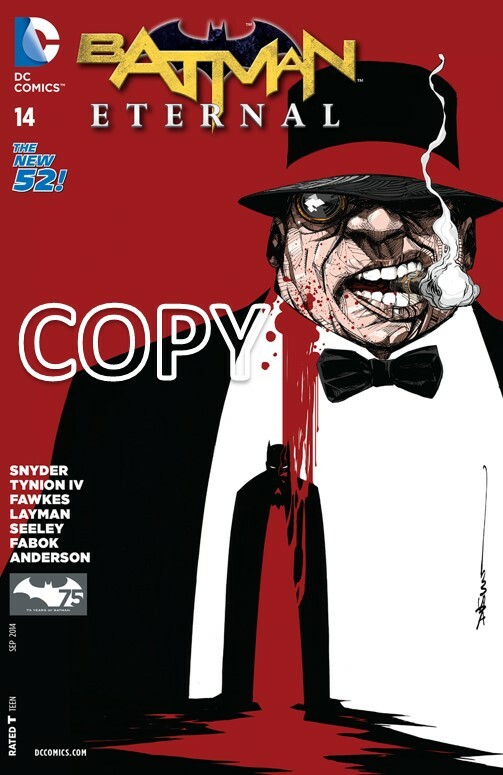 As always we begin with the cover, we see a full upper body shot of the Penguin with Batman below. This is a very well-drawn cover, the Penguin is very detailed. Even though this is a well-drawn cover, this is very similar to a cover of a graphic novel published by Marvel a few months back. We begin in Arkham Asylum as the Scarecrow make a voice diary of something unknown in Arkham. I have seen this type of scene many times but never from a villain’s perspective. The Scarecrow is drawn well enough. As we hear a scream from Arkham we cut to a motel where the Penguin and his goons are hanging out. The Penguin complains about how the motel is beneath him and yells at his goons. The Penguin is very well drawn and he is acting like the Penguin should. The motel and the motel room are drawn very realistically. The Penguin kills one of his henchmen as he rants about how he’s sick of being pushed around. We get an excellent close-up of the Penguins eyes as he delivers the killing blow. We cut to the mayor’s office where James Bard is confronting the mayor about the Falcone conspiracy. James Bard proves in this scene that he is willing to play dirty to get what he wants. James Bard and the mayor are both drawn well. This scene reminds me of the opening scene of “Diamonds Are Forever”. We catch up with Jim Gordon at Blackgate Prison as he contemplates his son’s offer. His friend Leo comes and sits down with him at lunch offering company. Both Jim Gordon and Leo are drawn really well and I like that Jim Gordon made a friend in prison. Leo tries to comfort Jim Gordon but does not succeed. This is another step in showing Jim Gordon’s depression and it is very accurate. At the hide-out of Carmine Falcone we see Carmine Falcone talking to an associate over the phone. Carmine Falcone is drawn better than he has been and looks younger. Carmine Falcone is interrupted by the Penguin talking to him through the door. They argue about who should control the city. As Carmine Falcone opens the door, the Penguin throws a knife into Falcone’s wrist. It is not drawn as gory as it could be. The Penguin slides the knife out of Carmine Falcone’s wrist. This looks painful even for me. As the Penguin holds the knife to Carmine Falcone’s neck, James Bard and a SWAT team race in to arrest them. We learn that Interim Commissioner Forbes has been arrested off panel. I would have preferred that we see the arrest. Vicki Vale is there to document the arrest and is drawn OK.
Back at Blackgate Prison Jim Gordon tries to escape but is caught by Batman. This makes me mad. Jim Gordon is not desperate enough to do this. The reason I know this, I’ve been in a similar situation and it feels like Jim Gordon has missed a few steps. The good news is Batman is drawn decently. Batman convinces Jim Gordon to go back to his cell as they talk about James Bard. This is more foreshadowing that James Bard could be Batman’s new partner. We cut to Red Robin flying in his plane while checking the news. He learns that there is another passenger in his plane. Red Robin learns that Harper Row is that person hanging out in the cargo bay. Red Robin could be drawn a lot better but Harper Row is drawn decently. This scene adds a bit of humour to a dark story. Batman meets James Bard on a roof top to congratulate him. This is a great scene but why on earth was James Bard calling his mother in the middle of a rain storm. We learn that James Bard’s tip from a news source cost 12 lives. We are uncertain if it was James Bard’s tip or someone elses. We end our story back at Arkham where the Scarecrow wakes up to find the Joker’s daughter trying to kill him. The Joker’s daughter is drawn OK. This issue was a good story despite the few problem I had with it.